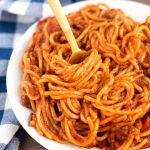 I love to make Instant Pot Spaghetti with meat sauce when I want a faster meal that will feed the family and fill us up. This semi-homemade one-pot pressure cooker spaghetti is easy to make, and turns out delicious. It is also pretty versatile! You come home from work, and the kids are needing help with their homework. The dog needs walking. There are sports, showers, chores. All of it. Oh yeah, and you need to make dinner, too! You are craving spaghetti. Spaghetti takes a long time to prepare, when you make it homemade. 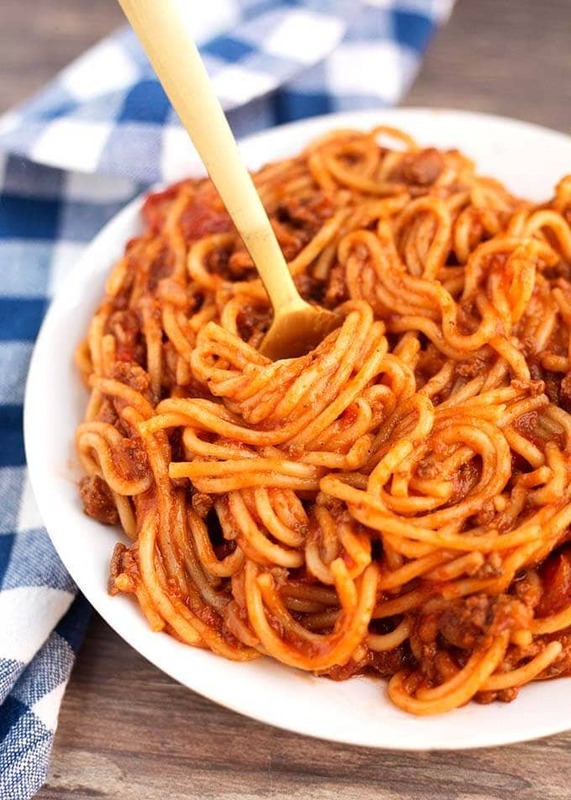 But this semi-homemade Instant Pot Spaghetti is a great solution! If you have some homemade sauce, you can use that! On a busy day, you might want to opt for this pressure cooker Spaghetti recipe. It can be cooked in one pot, and after browning the meat, you just layer in the ingredients and go do your thing until it’s done! 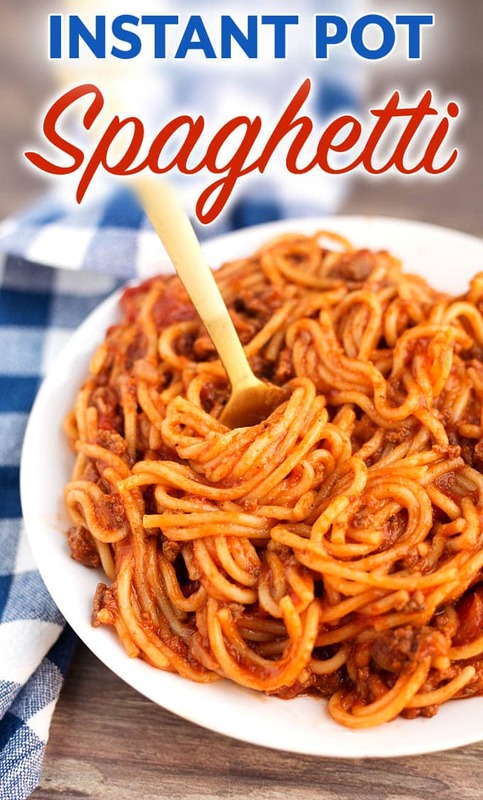 Using your favorite jarred spaghetti sauce, marinara, or homemade, and some extra spices, you can make this the way you and your family will love! Brown the meat in the Instant Pot on sauté. Add onion and spices to the pot. Layer the pasta in a random patter to avoid clumping. Pour pasta sauce over the noodles. don’t stir. Put lid on and pressure cook on High pressure. Quick release the pressure and open the Instant Pot. If you would rather have meatballs, I made a separate recipe for that: Instant Pot Spaghetti and Meatballs. 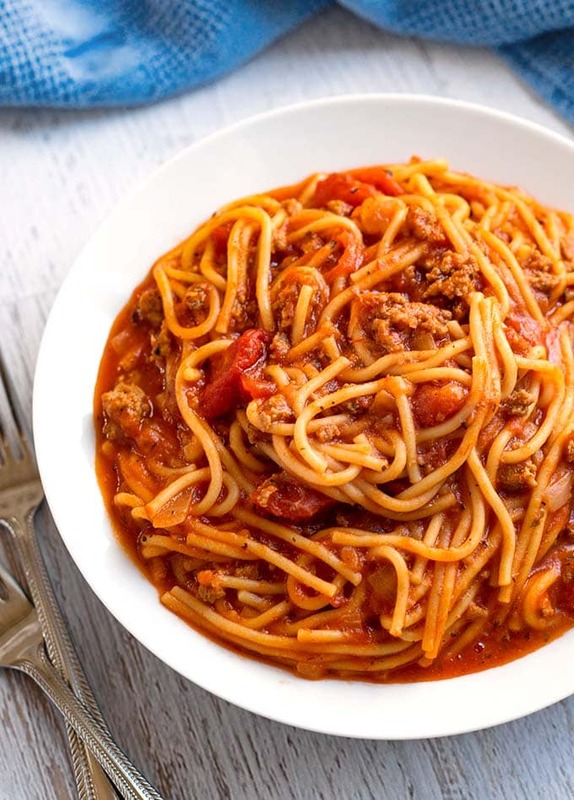 Instant Pot Spaghetti is a one pot spaghetti that turns out delicious, and is easy and quick to make. A semi-homemade Pressure cooker spaghetti that the whole family will enjoy. Perfect on a busy day. Turn your pot on to the Sauté setting. When it is hot, add the ground beef (If using ground turkey, add 1 Tbsp olive oil and add the onions, then add the ground turkey). Stir to break apart the meat. Add the onions and the salt, pepper, Italian seasoning, and basil. Cook for a few minutes, stirring occasionally, until the meat is mostly done, and the onions are turning translucent. Add the garlic and cook, stirring frequently, for 1 minute. Scatter in the spaghetti noodles (broken in thirds) in a random fashion, so they are not al laying side-by-side. This keeps them from sticking together. Pour on the diced tomatoes evenly over the noodles. Pour on the spaghetti sauce, evenly, completely covering all of the noodles (exposed noodles may not cook completely). Pour in the broth/water down the inner side of the stainless liner, so the sauce doesn't wash off of the noodles. Close the lid and lock in place. Set the steam release knob to the Sealing position. Cancel the Sauté setting. Press the Pressure Cook/Manual button or dial and use the + or - or dial to select 8 minutes (for softer noodles) or 6 minutes (for more al dente). When the cooking cycle is finished, turn off the pot and do a controlled Quick Release of the pressure/steam. When the pin in the lid drops down, you can open the lid. Garnish with parmesan cheese and serve with some French bread. The amount and type of seasonings you use will depend on the sauce you use, and your personal preference. I like to use marinara, and add lots of seasoning. Subscribe For the Newest Recipes! Receive My Latest Recipes Right in Your Inbox! I may occasionally send you an update of what else is new. What size instant pot did you use? I’d like to try it. I used a 6 qt, and you could use an 8 qt as well. I’m Sandy - foodie with a passion for cooking and sharing my tasty recipes. My hubby Paul, our Pug Gizmo, and I live in Washington. When I'm not cooking, you'll find me reading a good book. This website and its contents are the copyright of Simply Happy Foodie LLC – © 2016-2019. All rights reserved.